Network DVD have over the years provided fans with outstanding DVDs, Blu-Ray, and CDs and now in April 2013 can also add Vinyl to their list of available formats. 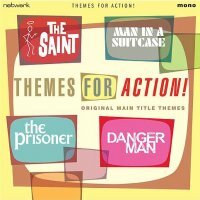 To coincide with "Record Store Day", where folk are enticed into independent record shops with the promise of Vinyl exclusives, Network released "Themes for Action", a 7-inch vinyl single which includes remastered versions of the themes from "The Prisoner", "Danger Man", "The Saint", and "Man in a Suitcase". The item is only available from such stockists and not from Network itself, with Banquet Records (HERE) being the cheapest online retailer at £8 plus P&P. Vinyl LPs of such soundtracks are slated to appear in the future. Watch this space! 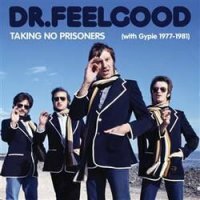 In other music news, Dr Feelgood's forthcoming 4-disc CD set also has a "Prisoner" theme. Called "Taking no Prisoners" the band can be seen on the front cover wearing piped blazers and giving a "Be Seeing You" salute (below). With thanks to Network Distributing and Darren Stokes for this news item.